To Save Wildlife, Namibia's Farmers Take Control Imagine the U.S. government saying to the people living around Yellowstone, "You know what? All those wild animals in the park — the grizzlies, the bison, the wolves — they belong to you." This is exactly what the government of Namibia has done in a radical experiment to save wildlife — and the people who share their land. He heard somebody screaming. "When I opened my eyes it was this elephant," Neftali says. "He was so big, standing there, he could see us. All I did was to like, fall to my feet. And he hit the bungalow somewhere in the roof. The things that you see in movies. We can hear him breathing so heavy, like very angry." Everybody froze. The elephant paused, then turned to the next building. "He threw off that roof completely. He took out all the toilets." After trashing the building, the elephant turned and left. I ask Neftali why he's willing to risk his life to be a wildlife manager. "I love it," he says simply, "to be in nature." There are others like Neftali, people who have left raising livestock to participate in a radical experiment in Namibia: helping wildlife survive by putting their fate in the hands of the people who share their lands. It's as though the U.S. government said to the people who live around Yellowstone National Park, "You know what? All those wild animals in the park — the grizzlies, the bison, the wolves — they belong to you." In the mid-'90s, the Namibian government did that. Mostly in the arid northwest, farmers and others who lived from the land were allowed to form "communal conservancies." These are like village councils. They wield control over the wildlife within the conservancy boundaries, which are set by conservancy members and the central government. Conservancies then partner with tourist lodges and safari companies and take a cut of the income from tourists who come to see the giraffes, zebras, lions, rhinoceroses and other exotic animals. They operate campsites, too. And they collect thousands of dollars from trophy hunters who come to shoot lions and cheetahs and antelopes. A single lion can bring in up to $10,000. Since the conservancies started in 1998, they've collected nearly $27 million in gross income, in a country where rural families live on a few dollars a day. As a result, poaching has been nearly wiped out in Namibia, and wildlife numbers are rising. Meanwhile, across Africa, wildlife numbers are declining as human populations chip away at habitat and poaching increases for bush meat and black market items like rhino horns. But living with wildlife — and profiting from it — hasn't been easy. Especially when most of the time, a rural Namibian's first instinct may be to protect his or her livestock. 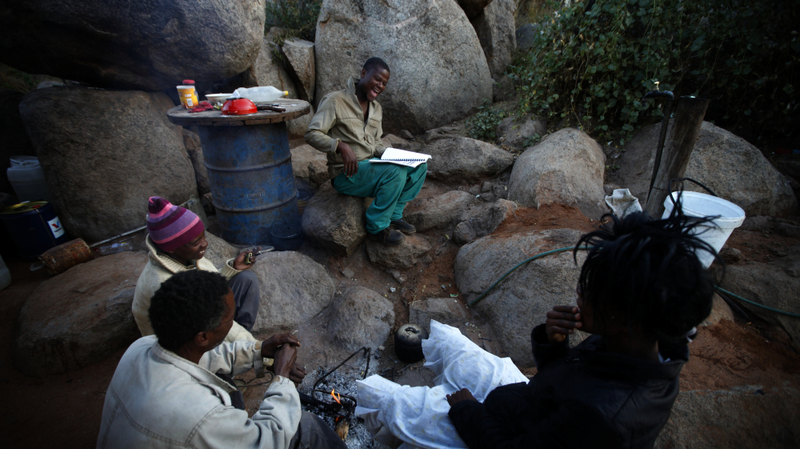 A group of Khoadi-Hoas conservancy members meet over morning tea at the Hoada campsite in northwestern Namibia. A few days after my truck ride with Neftali, I'm in the Khoadi-Hoas conservancy, riding in a donkey cart with Albert Gureseb. The conservancy is a little bit smaller than Rhode Island; about 3,200 people live within its boundaries. Gureseb got his first job with Khoadi-Hoas as a hunting guide. These days, he handles damage control . Every week or so, Gureseb makes the rounds of local farms, looking for farmers who have lost livestock to predators. This is the price of success: Wildlife roams freely around across the conservancies. And that means around the farmers. There's no fence or buffer zone to keep people, livestock and predators away from each other. "When the conservancy started, the number of predators increased because we were looking after them," says Gureseb. "That did not make people happy." 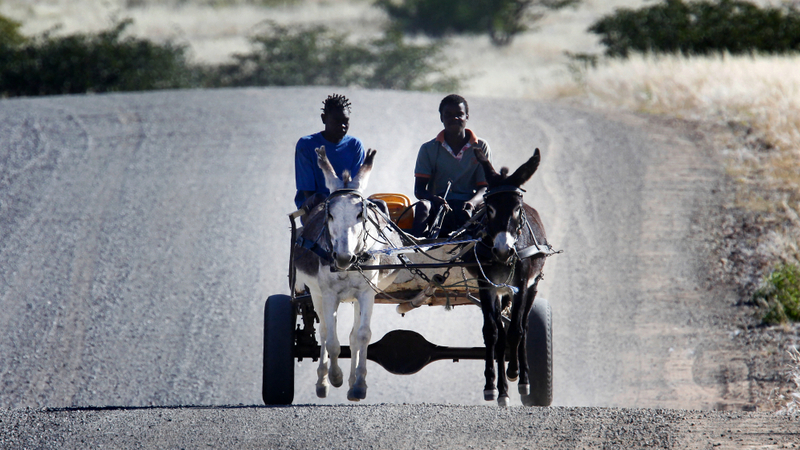 Rural conservancy residents rely on donkey carts to move materials around the vast expanses of northwest Namibia. We visit a one-room farmhouse on a dusty hill. Goats shuffle behind a wire fence. Katrina Katatumosa lives here with her daughter. As she tends an open fire under a pot of beans, she says a cheetah ate three of her goats just the other night. She stood by, helpless. Katatumosa complains that the conservancy doesn't pay the full market value of her goats. Even if they did, she says, she still would want the cheetahs dead. Gureseb smiles. He says he understands but reminds her that outside the conservancies, farmers get nothing at all when a predator kills livestock. He agrees that it would be good to pay more, but the money just isn't there. The head of the Khoadi-Hoas conservancy, Hilga Howeses, says they ran through half their budget for reimbursing farmers for livestock in the first three months of the year. "We are doing better now," she says of the 13-year old conservancy, but she adds, "the biggest challenge is human-wildlife conflict." Farther down a dirt road, I meet Michael Guiseb at his uncle's farm. A few days before, an elephant came through and almost destroyed his cistern, a concrete tank 15 feet high. Elephants hunt water. To try to cut down on these human-animal conflicts, the conservancy is building them water wells, away from the farms. Guiseb says that's good. The wildlife had to adapt to people, he says. Now people must learn to adapt to wildlife. "Some people want to kill the elephants," says Guiseb, who is studying conservation. "But the good way is, let's conserve it. Bringing them closer to the wildlife, to the elephants, will change the attitude of the people." Most conservancy members I talked to say profiting from wildlife is better than when the white apartheid government owned it all. The modern country of Namibia started to coalesce in the late 19th century. Early German colonizers swindled large tracts of land from the indigenous people. In 1884, Germany took control of the area, calling the new colony South West Africa. Over the next few years, the indigenous people fought back. At least 65,000 Herero, one of the dominant groups living in the area, were killed in the uprisings. The Germans did recognize the value of the land and its wildlife, though. They set up what was the largest game reserve in the world at the time, in the rugged Kaokoveld region of the northwest. It covered an area the size of Maine, and was home to many native groups as well as some of Africa's most famous wildlife: rhinos, lions, elephants, giraffes and cheetahs. Germany lost the colony in a battle with South Africa in the middle of World War I. Over the next few decades, native populations lost even more rights under the apartheid South African government. In 1967, the government gave white landowners formal ownership of game on their land. Many of the animals living on rural communal lands were shipped away to a newly established national park for protection — part of the new "fortress conservation" movement taking hold in Africa. In 2009, the Namibian conservancy received more than $9 million in funding from government and NGO sources. The system earned over $4 million from tourism-related activities. Conservancies on a whole spent nearly $4 million in 2009. 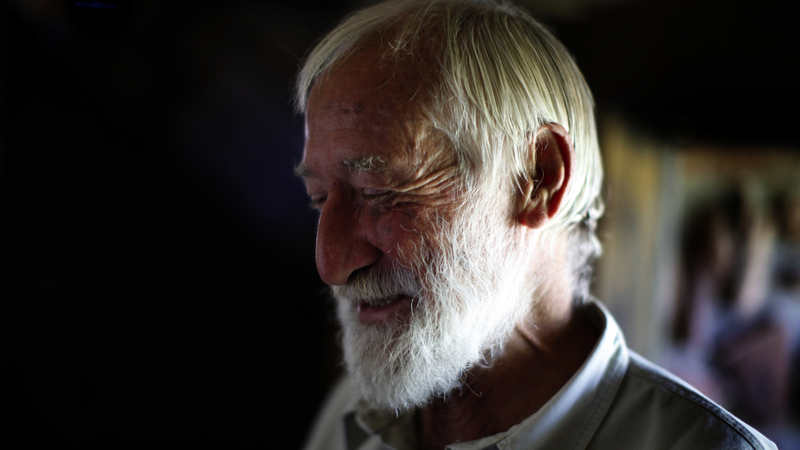 Garth Owen-Smith was a young South African who moved to the Kaokoveld around this time. He found herdsmen and the wildlife under an increasing strain. When Owen-Smith came to the Kaokoveld, it was an area under increasing duress — for farmers and for wildlife. In 1966, the United Nations had ordered South Africa out of the newly named Namibia, but the apartheid regime tightened its hold instead, and soon after a war for independence erupted. 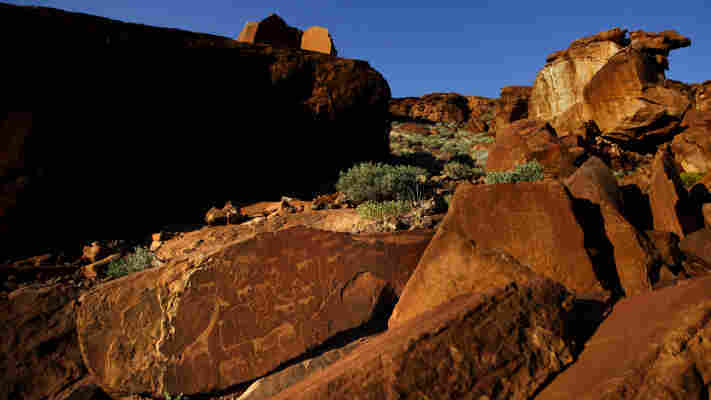 In 1970, the South African government de-proclaimed the large Kaokoveld reserve established under the Germans and started carving it up into designated "homelands" for indigenous people. The majority of the country's population was pushed onto just 40 percent of the land. Most native families were given too little land to make a living from either farming or ranching, so for many poaching was a necessary evil. At the same time that white government officials took sport hunting trips onto the smaller game reserves, native poachers were often subject to brutal treatment if caught. "It was a disastrous situation," Owen-Smith recalls. "Black people were alienated. Wildlife was for the elites, whites only." War broke out in the country. Poaching by soldiers and by rural farmers was rampant. Life was hand to mouth. Many species were on the edge of extinction there. It's hard to imagine this from where Owen-Smith now sits — at his desert oasis, a compound of stone bungalows shaded by trees, called "World's End." He lives here part of the year with his partner, Margaret Jacobsohn. World's End has also become a hub for conservancy meetings, where members camp for days to talk business, compare notes and learn everything from wildlife management to accounting. "Game used to be very important for rural people," Owen-Smith says. "For meat, for skins and for trade. But with colonialism, wildlife became state property, and for any local person to hunt was poaching, and he could go to jail. It was almost a Robin Hood syndrome." "There was no future in this for Africa," he says. For wildlife to survive, it had to once again have meaning for the rural people who lived around it. Conservation leader Garth Owen-Smith now lives at a remote environmental station in the Kunene (Kaokoveld) region of northwest Namibia. Owen-Smith and local conservationists organized themselves into a nongovernmental organization called Integrated Rural Development and Nature Conservation, or IRDNC. They reached out to the Herero headmen, asking them to figure out a way to stop the poaching. "It was as much their idea as ours," Owen-Smith recalls. "They did not want to see the game wiped out. But as it belonged to the government, they said, 'Well, that's the government's responsibility to stop the hunting.' "
That wasn't going to happen, he says. At the time, there were two government workers sharing one vehicle to patrol an area of 25 million acres. Paying the local people to stop poaching wasn't going to work either. "That is the key that is often forgotten," says Owen-Smith. "People think if they are getting financial benefit from something, it will change the way they think. That may be how Westerners think. But out there, there was a real hostility to conservation, for the fact that a valuable resource had been taken away from them and they wanted the ownership back of that resource." Owen-Smith and the headmen decided to enforce a de facto ownership. The traditional leaders appointed their own game guards. The headmen knew who in the community was reliable, and they knew who could find the poachers: people who were poachers themselves. Turning poachers into game guards worked. "They were able to stop the poaching within a few years, and we haven't looked back." By the time Namibia won its independence from South Africa in 1990, wildlife had rebounded under the game guard system. The next step was to organize this loose confederation of game guards and have the system officially recognized by the government. Rural people organized committees to sign up members and manage wildlife on a wider scale. Margaret Jacobsohn is Owen-Smith's partner and an anthropologist who has lived in Namibia for 27 years. "There was a vision that one day wildlife would be our gold," she told me. "That it would be more valuable alive than in cooking pots." International conservation and development organizations took note. 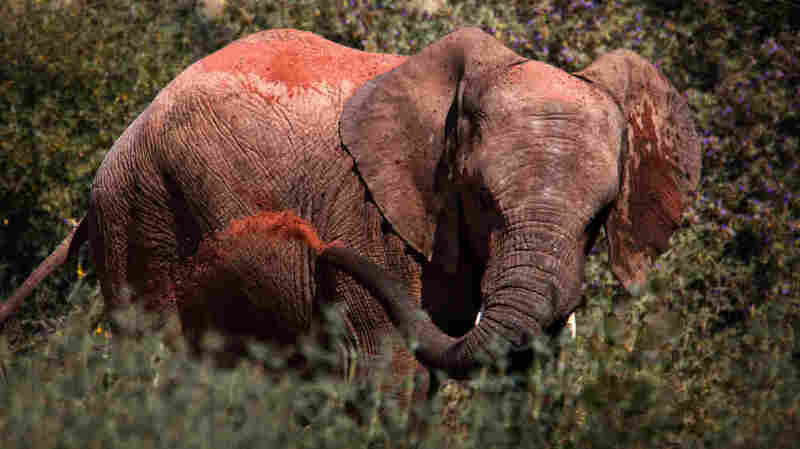 Starting in 1992, the World Wildlife Fund and USAID invested nearly $17 million to help launch the conservancy system. "In these sorts of areas, with very low populations, wildlife is actually a better form of land use than livestock farming," says WWF-Namibia's Greg Stuart-Hill. "Livestock farming generates one or two cattle herders, or goat herders, whereas the wildlife industry generates a broad cross section of economic opportunities." In 1996, the multiracial government passed legislation that gave back to black Namibians the right to manage their wildlife. The legislation set up terms for how to create and register a communal conservancy and how to become eligible to receive financial aid and guidance from international donors and NGOs. In the wake of this legislation, rural groups were lining up in the nation's capital of Windhoek to set up conservancies. By 2011, communities had banded together to form 64 conservancies. A young elephant sprays sand on his back to keep the midday sun off, or maybe for fun, in Twyfelfontein conservancy. Numbers for many species, including the endangered black rhino, are now strong and holding steady. Rhinos are up from about six in the northwest in the early '80s to more than 1,400. Cheetahs have gone from 2,000 in the 1980s to 4,000 today. In 1995, there were about 7,500 elephants in Namibia. Today, there are at least 16,000. The conservancy system isn't entirely responsible, but it is a big part of a government-supported, nationwide conservation effort. Lions are back, too. According to Chris Weaver, head of World Wildlife Fund-Namibia, in 1995 lions numbered fewer than 20 in northwest Namibia. Today, the population is closer to 125. On a drive through the red desert and scrub of the Torra Conservancy in the northwestern region of Kunene, we spot a thicket of green at the end of a dirt track, which means a spring. And where there's water in Kunene, there's usually a bush camp. Hunters in camouflage sit around a fire drinking coffee from metal cups. Among them is Dirk Nesenberend. He owns a gun shop in Windhoek, the capital. "I grew up shooting and hunting from an early age," he tells me. He's carrying a .280 Remington, which can bring down an antelope at 300 yards in the right conditions. "Shoot for the brain," he says. It's quickest and most humane. 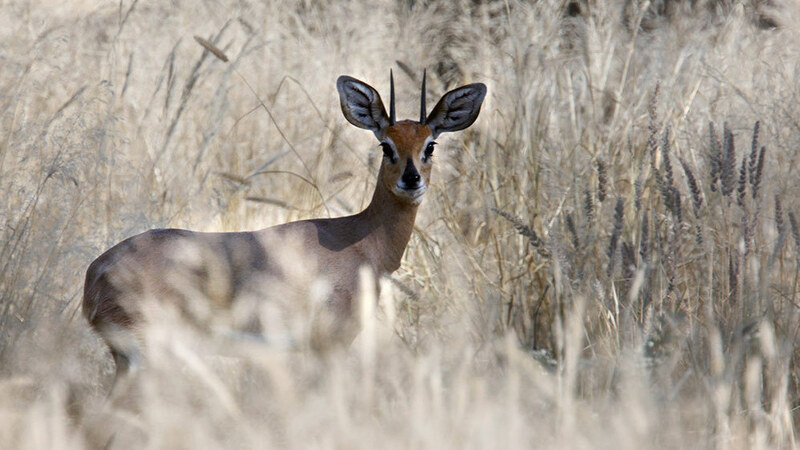 A male steenbok peers from behind a veil of grass in Twyfelfontein conservancy. Nesenberend and the other hunters put noise suppressors on their rifles. If they don't, game will scatter after the first shot. Moreover, they'll learn to associate vehicles and people with being shot, and run away at first sight. That would be bad for the tourism industry. "Tourists, if they come here and not see any animals, it's not going to be a successful tourism industry," Nesenberend says. The hunters aren't here as paying guests. They've been invited by the Torra Conservancy to help cull herds and provide bush meat for conservancy members. Torra is just southwest of Khoadi-Hoas. The two are among the oldest conservancies, established in 1998 and currently involving a combined 4,400 members..
Hunt leader Richard Fryer directs the team down a back road, out of the sight of safari vans full of tourists. His bull terrier, Jesse, sits next to the gearshift, panting with excitement. He likes the hunt. Fryer once was a soldier. Now he's a wildlife manager with the IRDNC, the NGO founded by Owen-Smith. We soon find a herd of springbok: deerlike, though a bit smaller. Known for their bounding leaps as they run, they're tan and white, with curved horns, almost heart-shaped. It's been a wet year; the springbok are grazing on tall green grass. Fryer calculates the distance to the target through binoculars. At 248 yards, the shooter fires a shot. Then another. "They're good," Fryer says of the hunters. Conservancy members here tried to do a big cull but it didn't work well. "You've got to have the right equipment, the right rifle, a good scope." 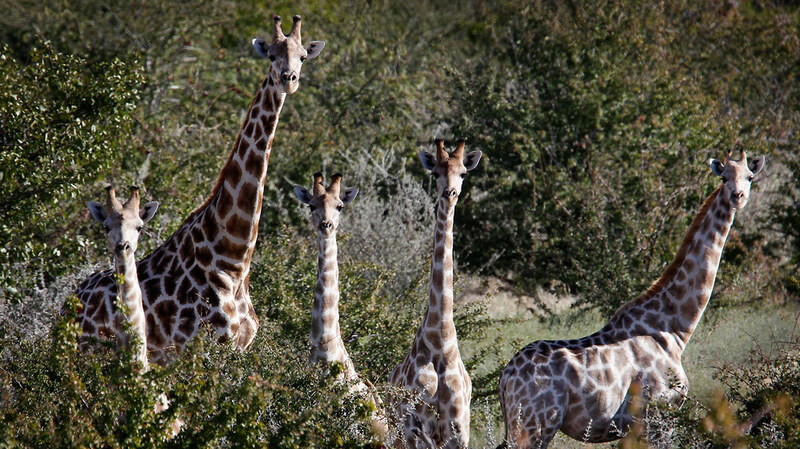 Spooked by a noise, giraffes in northwest Namibia interrupt lunch to look around. These rifles cost thousands of dollars. Each bullet costs a couple of U.S. dollars. With a cull of 230 animals, those costs are almost prohibitive for conservancies still very much struggling to make ends meet. The hunters donate their time, and supply their own equipment, in exchange for the opportunity to hunt. We walk up a rocky hill to retrieve the dead animals. Each springbok provides about 30 pounds of meat. Young men from the conservancy haul the two animals to the truck and load them in the back. Later in the afternoon at a nearby farm, young men hang the day's kill from hooks and begin the butchering. They'll deliver the meat to local farmers. About 40 percent of conservancy members are eligible for free bush meat in northwest Namibia. The conservancies also allow trophy hunting for lions, cheetahs, elephants and other big animals. It's the second-biggest source of income for conservancies, after tourist lodges. Trophy hunting brought in nearly $700,000 of the roughly $4 million a year the conservancy program made as a whole in 2009. All of this hunting raises hackles among those who see wildlife as something only to look at and photograph. But not for Owen-Smith. Sitting in the shade of his bungalow at World's End, he says conservationists can be naive. "A lot of conservationists are actually protectionists. They see wildlife as some elevated animals." He says that goes for tourists as well. "The perception in the eyes of many tourists and usually urban people is that wildlife is something sacred. We don't mind cattle being killed, or sheep or goats being killed, but you can't kill wildlife. Which is a nonsensical perception." Living with animals and profiting is a thorny business, but it's working in Namibia. As wildlife numbers decrease across Africa, they're flourishing here. Namibia is one of the most sparsely populated countries in Africa, with 2 million people living in an area comparable to Louisiana and Texas combined. People and animals here don't compete for land the way they do in Kenya, for example. Nonetheless, it's still a poor country, with few natural resources beyond its wildlife and rugged beauty. And it has few avenues of economic opportunity and development for its people. The conservancies still receive about $10 million a year in support, but at an individual level, 21 are now self-financing. They make enough money from tourism, trophy hunting and handicrafts to cover their costs and even provide social benefits such as HIV/AIDS care. "More and more communities are wanting to join this conservancy program," says Stuart-Hill of WWF-Namibia. "We no longer have to go out and try and convince people that wildlife is a good opportunity. They're knocking on the doors, they're knocking constantly, looking to organize themselves, register conservancies. I think it's started a big movement." Owen-Smith retired last year from IRDNC, handing it over to John Kasaona, son of one of the first poachers turned game guards. Kasaona says conservancies mean more than income for poor farmers. "People are making decisions. The same decisions they would make on their own livestock, they are making it on wildlife. So it gives them a sense of ownership — 'This thing is ours. We are proud of it.' It ensures that it will support you for as long as you are on this planet." The whole system has been a steep learning curve for rural people as they transform from subsistence farmers to small-business owners. Some conservancies are failing — not all are rich in wildlife. But the success of others shows that wilderness in Africa can pay its own way, and more. 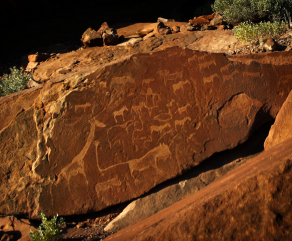 The prehistoric rock drawings at Twyfelfontein, a UNESCO World Heritage Site, reflects the ancient relationship between indigenous peoples and wildlife. "We have got open landscape, still not occupied by human beings," Kasaona says. "If we don't look after the resources, I don't know how Africa is to support its citizens."